In Colorado, more than 10,000 teachers were demonstrating Thursday and Friday in Denver, using personal time to rally for more money for their classrooms. About half of the state’s 900,000 students have shuttered schools as a result. Average teacher pay in Colorado was $51,808 in 2017, which ranks 31st among states and the District of Columbia, according to a National Education Association reportreleased earlier this month. The same report lists the average teacher’s salary in Arizona as $47,403, ranking 44th. Teachers’ average starting pay in Colorado was $32,980 for the 2016-17 school year, according to NEA research. That ranks Colorado fourth from the bottom, lower than Arizona, where the average starting salary is $34,068. 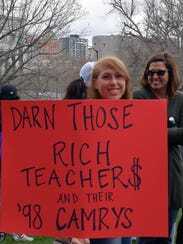 Since Colorado lawmakers don’t h ave the power to raise taxes without asking voters, teachers there not expecting an immediate fix. The teachers’ union is backing a ballot initiative to raise taxes on people earning more than $150,000 a year and corporations. 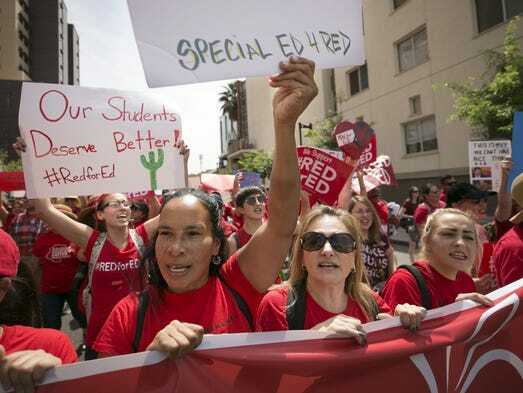 Arizona’s grassroots #RedForEd movement began with a peaceful demonstration in early March and spiraled into what could be a multi-day walkout intended to pressure Ducey and state lawmakers to restore a decade of cuts to education. Educators’ demands include immediate 20% teacher pay raises, competitive pay for support staff such as bus drivers and paraprofessionals, and restoring the $1 billion in state money for education that has been cut since the recession. “A lot of people think all the teachers are out here for their own pay, but we are out here for funding for classroom and kids,” Candice Brownd said. She teaches second grade at Copper Trails School in Goodyear, Ariz., about 20 miles west of Phoenix. Ducey has proposed to give teachers 20% pay raises by 2020 without raising taxes. While the Republican governor has said he is committed to making his plan a reality, most legislators don’t appear to support it. 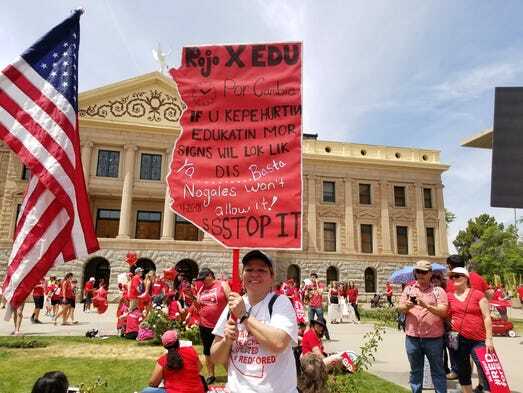 A prominent TV news anchor, Kari Lake at KSAZ-TV, Phoenix, created controversy Tuesday when she tweeted that Arizona’s #RedForEd movement was a push to legalize marijuana. She deleted the tweet and apologized on the station’s 9 p.m. broadcast the night before the walkout but kept a Facebook post up that raised similar questions. Colorado, the first state to legalize recreational marijuana use doesn’t use pot tax revenue in the classroom. Some of the $129 million in state sales taxes — $40 million — is set aside to build new schools; a few million more goes into a public school fund, where it is far less than 1% of the total needed to run public schools in Colorado. Posted in Advocacy, Educators Protest, Every Student Succeeds Act, Funding For Education, No Child Left Behind Act, Students and Parents Protest and tagged "Standing Strong for Public Education", #iBelieve, Accountability, Accountability System, Advocacy, Department of Education, Diversity, Education, Education Funding, English Language Learners, Equity, Every Student Succeeds Act (ESSA), Failing Schools, Federal Education Policy, High-Needs Students, NEAExecutiveCommittee, Pensions, Public Education, State Budget, Students, Tax, Testing and Accountability. Bookmark the permalink.